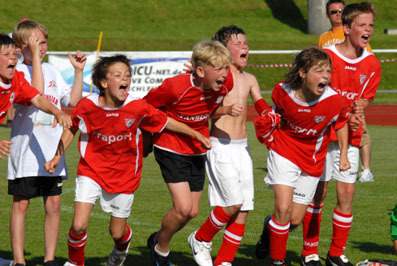 The Danone Nations Cup is world’s greatest soccer tournament for young players, 10 to 12 years old. Out of 700 participating teams in Germany 28 had qualified for the national finals through regional preliminaries. The finals were held in the Brita-Arena in Wiesbaden on June, 5th. In October the winning team from SpVgg Greuther Fuerth will fly to Madrid to take part in the world finals, where they’ll meet kids from 39 other countries from all over the world. What an experience for young sportspeople! 40 countries worlwide, 40 teams, 40 national tournaments, more than 2,5 million kids, that's the Danone Nations Cup, the biggest soccer event imaginable on this planet for boys and girls under the age of thirteen. The last world final took place in the beautiful city of Madrid. What an experience for the young athletes having the opportunity to display their talents in the legendary Bernabéau Stadium! And the trophy was presented by Zinedine Zidane to the team of Brazil.